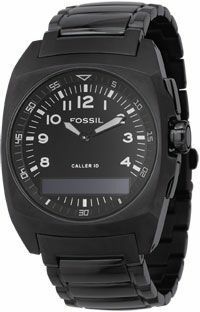 Fossil, a USA based watch manufacturing company have launched a watch Fossil Caller ID style FX6001, that can show the incoming caller ID on its dial. It has a 96×16 pixel OLED display. By incorporating Bluetooth wireless technology the watch will change the dynamics of how people interact and engage their mobiles. It notifies you when your phone rings by a vibration showing callers name or number. The watch manufacturer found its ally in Sony Ericsson and this watch is compatible to certain Bluetooth enabled models of Sony Ericsson. The design of the watch was adapted from top selling Fossil models. If the user is unable to answer the phone the incoming call can be rejected or muted by the press of a button on the watch. It also has text message notification and can be recharged through USB or Universal AC adapter. The FOSSIL Caller ID is priced at an MSRP of $250.00 USD and will be available in late October.